Like Danielle, I had mixed feelings about Molly Gloss’s novel Wild Life. To begin with the positive, there were times in this book where I felt thoroughly engaged. It’s in part an adventure story, and the main character, Charlotte, does have some great adventures. The novel takes place in the west, somewhere around the Washington/Oregon border, in the early 20th century. It’s logging territory, and a pretty wild, uncertain place. Charlotte lives with her five children, trying to carve out a writing career. Her husband is not in the picture, but she has a woman who acts as nanny, which allows her to sneak off now and then to get some writing done. The adventure begins when the nanny’s granddaughter disappears in the woods. When search parties fail to find her, Charlotte decides she needs to go search for her herself. She takes off into the wilderness and soon enough gets lost herself. These passages were exciting. I could imagine all too well what Charlotte was experiencing as she struggled to find her way back to civilization. The book has fantasy elements to it, but they don’t become part of the story until Charlotte gets lost: while wandering around the woods nearly starved to death, she comes across a group of large human-like creatures, frightening-looking but kind animals, who slowly adopt her into their community. The creatures’ lives are endangered by the encroachments of logging; they need space in which to wander and forage for food, but that space is quickly disappearing. All this works pretty well, although the fantasy element comes too late in the book to feel natural and properly-integrated. The book’s structure is odd in one way — the pacing is wildly uneven — but quite interesting in another: it is a mix of several genres. The main story is told through Charlotte’s diary, but interspersed throughout are fragments of her fiction, stories that are sometimes based on her own life and so rework the material in the diary, and also Charlotte’s essay-like ponderings on what it means to be a woman writer. These materials reinforce each other by exploring themes and ideas from different perspectives, so we can see Charlotte’s life told through her diary and also transformed into fiction. What bothered me, and I couldn’t shake the feeling although I’m not sure how fair this is, was that Charlotte felt unrealistic, too much of a fantasy figure. For her to be able to write as much as she does without a husband and with five sons seems improbable, even given the nanny. But even more so, her feminism seemed fashioned purposely to please 21st-century audiences rather than to capture a truth about the time period. I know that feminism at the turn of the last century was well-developed and that people were making arguments about women’s writing similar to Charlotte’s, but Charlotte seems just too perfect. She defies stereotypes about women at every turn, in the way she dresses and acts, in her conversation, in the way she treats men, in her writing. I am all for strong female characters who defy gender stereotypes, but I don’t want to be jerked out of the world of the story by the feeling that I’m being presented with an argument rather than a character. All in all, it’s a pretty odd book, although not entirely in a bad way. The book’s various elements — the wild west, the fantasy, the feminism, the theorizing about gender and writing, the experimenting with structure — don’t quite cohere, but it’s interesting in parts, and it’s fun when the story finally hooks you and you absolutely have to know how Charlotte is going to make it out of the woods. I’m not going to pretend to get caught up on reviews or review everything I’ve read lately, but I would like to say at least something about a few books I’ve finished recently. The Laughing Policeman, by Maj Sjöwall and Per Wahlöö. I chose this book for my mystery book group and am glad I did, because I liked it very much and most of the members of my book group did as well. This is the fourth in what’s called the Martin Beck series, but Martin Beck is really just one of a group of characters and doesn’t stand out much more than the others. The book is dark, as one expects of Scandinavian crime fiction, and the writing is very good. I’m not sure how the authors divided up the writing, but whatever they did worked well. I liked the interaction among all the officers, and I thought the dark humor that runs throughout the book was great. Maria Edgeworth’s Helen. This was a bit of a disappointment. It tells an interesting story and takes up some important themes of the early 19th century, but it’s too long, with too many digressions. The story is partly about the complicated friendship between Helen and Cecilia; Helen is your typical nearly-perfect heroine of early fiction, and Cecilia is charming and gracious but has a fatal flaw: when under pressure, she hides the truth about herself. This puts Helen in danger and threatens her potential marriage. The novel is also about unreasonable expectations (or at least I think they are unreasonable expectations — it’s hard to tell what Edgeworth’s stance is) placed on women to love one man only during the course of their lives. The social critique here is interesting, but the novel needed some serious editing. William James’s The Varieties of Religious Experience. I really loved this book. James surveys a range of religious experiences, focusing on the personal rather than on the institutional aspects of religion. His approach is for the most part nonjudgmental; he wants to describe and understand rather than to judge. The basic idea he is working with is that our religious experiences stem from our individual psychological histories and that the many varieties of religious experience exist because humans have a wide range of religious needs. I valued most his tolerant and open-minded approach, as well as his very pragmatic idea that we should follow the religious practices and beliefs that suit our needs most. Shirley Jackson’s We Have Always Lived in the Castle. This book was so much fun! Before this, I had only read “The Lottery” by Jackson, and now I’m ready to read more. I loved Jackson’s use of point of view; she writes in the first person and uses it masterfully to slowly reveal information about the protagonist and her family — information that, as it turns out, is really bizarre. The book isn’t scary exactly, but it’s incredibly creepy, and it perfectly maintains that tone right through to the end. I’m looking forward to reading The Haunting of Hill House very much. I loved How To Talk About Books You Haven’t Read by Pierre Bayard, although I think I loved it as much for its tone and attitude as for the arguments it makes. I thought Bayard’s arguments were fascinating, if limited, but the real attraction was his way of saying things few others are willing to say (an attitude his title indicates well) and his refusal to take reading so terribly, terribly seriously. There was something very freeing about reading this book (and it’s not the fact that I now feel I can talk about books I haven’t read!). The title is a little misleading, because even though Bayard says he is going to give advice about how to talk about books you haven’t read, he only does that occasionally. Mostly the book is a meditation on what it means to have read something and on how small and uncertain the difference is between having read something and not having read it. If you think about it, is it meaningful to say that you have read a book you don’t remember a thing about beyond its title? Isn’t it possible to know much more about a book that you have recently skimmed than one you read 20 years ago and have completely forgotten? Isn’t it possible that you could say something more insightful about a book you have read a review of and understand from an exterior, distanced point of view, than one you have read and in whose details you have lost yourself? I’m not in the least interested in pretending to have read books I haven’t, but I realized as I read Bayard that I talk about books I haven’t read all the time: I do it in blog posts where I talk about what I want to read or why I bought particular books that are as yet unread. I recommend books I haven’t read to people I think might possibly like them (while admitting I haven’t read them), and I allude to books I haven’t read while I’m teaching class, in order to make some point about history or context. It’s this kind of book knowledge Bayard is interested in; he talks a lot about cultural literacy, which to him means knowledge of the ways books fit together, their relationships with one another and with their contexts. I can tell you something about a Trollope novel I haven’t read because I know a little about Trollope and a fair amount about the Victorian novel. I understand the context from which his novels come, and, for that matter, I know a lot about novels. If this is the kind of knowledge about books that matters, then actually having read the Trollope novel is kind of a minor detail. I don’t buy that argument fully — it leaves little room for the actual content of books to surprise you after all — but it does seem true that just by surrounding yourself with bookish people and culture, you can absorb a whole lot of knowledge about books you will never pick up. A bigger problem with Bayard’s argument is that he nowhere acknowledges that reading books might actually be fun. I don’t read solely for the purpose of gaining the kind of cultural literacy he describes (especially now that I’m out of grad school); I read because I want the experience of being absorbed in a book. But these disagreements aren’t what matter to me. What really matters is the fun of exploring the complexities of reading. Bayard deconstructs the reading/nonreading distinction, but he also undermines the very notion of a book, or rather, he makes up a whole bunch of “books” in addition to the actual book you hold in your hand. Because as soon as you have finished reading a book, you immediately construct your own version of it, a “book” that is only a little bit like what you have read. Every reader brings to books a certain history, capacity, and set of interests that shape how they make sense of them, which means the books they read are a little (or a lot) different than other people’s readings of the exact same books. So when we talk about books, we are really talking about entirely different things: I’m talking about my book and you are talking about yours, no matter whether the words we read are the same or not. So, given that logic, why not talk about books you haven’t read? One excellent point Bayard makes is that readers should lose the shame they feel about unread books. In fact, any reader’s relationship with books is primarily one of not having read them, since we can only read a very small percentage of all the books out there. Not only that, but our relationship with books we have read is one of loss: once we stop reading, our “inner” book becomes a separate thing from the book itself, and we immediately start the process of forgetting. The small percentage of what we remember, out of the tiny percentage of what we have actually read, leaves us with not a whole lot. These arguments don’t strike me as all that original; if you’ve studied philosophy or literary theory or just thought deeply about reading they won’t be particularly surprising. But Bayard does a great job of making the ideas fun. The book makes an interesting pairing with Alan Jacobs’s The Pleasures of Reading in an Age of Distraction; they seem like very different books in many ways, one urging us to read for pleasure and the other not even acknowledging that pleasure in reading exists. But both urge a certain freedom in our reading, whether it’s the freedom to read at whim, or freedom from the shame we feel at not having read things. Reading is a serious endeavor, yes, but we could all stand to lighten up a bit. This past Monday I had the chance to see Jennifer Egan and Jeffrey Eugenides do a reading at the 92nd St. Y. in Manhattan (a truly awesome place for readings). First it was dinner with two bookish friends at a Turkish restaurant around the corner from the Y., and then we headed into the crowd to find our seats at the sold-out event. Egan read a passage from A Visit From the Goon Squad first — a fairly lengthy passage that took her a half hour or so — and then Eugenides read from The Marriage Plot, and then they answered a few questions from the audience (thankfully these were questions screened by the event organizers — no worry that someone was going to ask something stupid). Both readings were funny and made the audience regularly laugh out loud. This is interesting to me because I don’t remember ever laughing at Goon Squad when I read it, not even silently laughing to myself, although I do remember the tone being light, and I’ve since read the relevant sections from The Marriage Plot and didn’t find myself laughing there either. But when someone reads out loud, somehow it’s different. The humor stands out more. It helps that Egan and Eugenides were skilled readers, but even if they had a flatter reading style, we probably would still have laughed. Generally when I see authors, I prefer to hear them speak about their writing rather than read from it, but this is an argument for listening to a book read aloud now and then. The only mildly disappointing part of the evening was that I didn’t get my books signed because the line was too long and would have required that I take a late train home on a Monday night, which didn’t seem like a good idea. But perhaps I’ll see them another time. 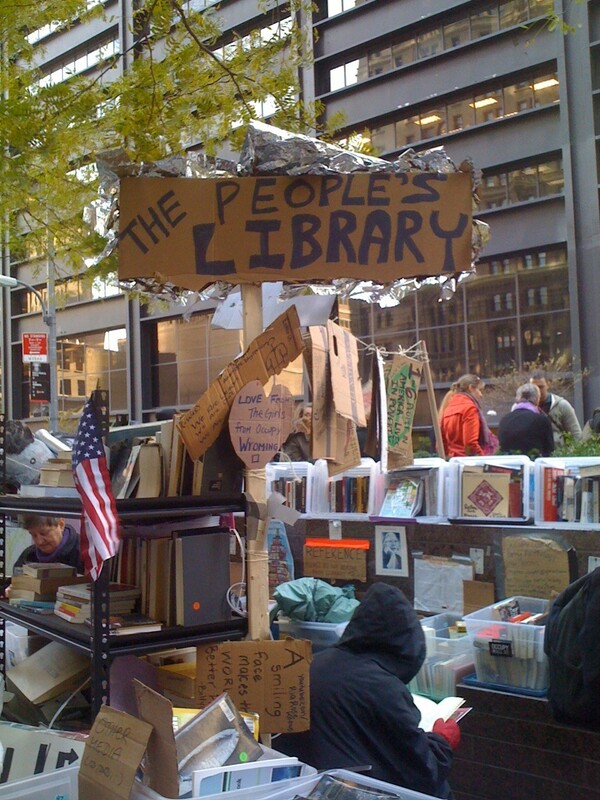 There’s something very wrong about police destroying thousands of books, isn’t there? 1. The book I’m currently reading: The Marriage Plot, which I started on the train ride home from the reading. I just finished up the first section, which takes place at Brown University, and from what I’ve heard of the book, I think we’re off to India next. I’m enjoying it very much. I’m also in the middle of Mariana, which got interrupted by The Marriage Plot. I usually don’t read two novels at once (unless one of them is an audio book), but I didn’t want to wait to start the Eugenides. I’m afraid I’m not giving Mariana its due. 2. 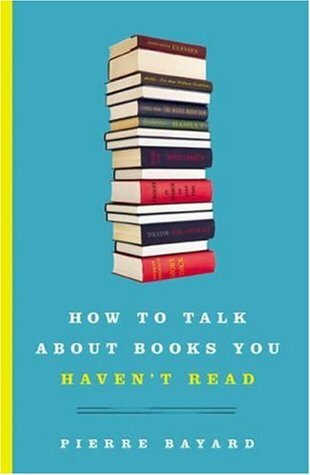 The last book I finished: How to Talk About Books You Haven’t Read by Pierre Bayard. I totally loved this book. I’ll write a post on it if I can manage it, but for now I’ll say it was a thoroughly enjoyable meditation on what reading and non-reading really mean and how the two aren’t nearly as different from each other as we generally imagine. I didn’t buy everything Bayard had to say, but that didn’t matter; I still loved it. There was something exhilarating about the freedom with which he explored the topic. 3. The next book I want to read: Next up will be Wild Life by Molly Gloss for the Slaves of Golconda. But I also need to choose a nonfiction book soon, and I have no idea what that will be. I’ve heard a couple interviews with Joan Didion lately, so maybe I will pick up a collection of her essays. Or perhaps one of my theoretical works on the essay genre, or perhaps a Janet Malcolm or Roland Barthes’s A Lover’s Discourse, which, if you have read The Marriage Plot, you will understand. 4. The last book I bought: The Marriage Plot, but also the third Julia Spencer-Fleming, Basho’s Narrow Road to the Interior, Joanna Russ’s How to Suppress Women’s Writing, and Ryan Van Meter’s If You Knew Then What I Know Now. Plus a whole raft of other books because I’ve gone a little crazy with the book buying this year. 5. The last book someone gave me: Laura Miller’s The Magician’s Book, about C.S. Lewis and the Chronicles of Narnia. Fabulous book. To pick up where I left off in my last post … we were out of power for six days total, and have had it back for a little over a week now. I’m still not at the point of taking heat and electricity for granted, though, especially since we had a high wind warning yesterday, which came with the additional warning that there might be some scattered power outages. Enough of this! Fortunately, we didn’t lose our power again, and our house is toasty warm and well-lit. It is so nice to be warm. One of these days I will write a book review again, but for now, I wanted to tell you about an awesome exhibit I went to last weekend at the New York Public Library celebrating 100 years since the opening of the library’s main building in Manhattan. I arrived at the library with only 45 minutes or so before it closed, so I had to rush through it, but it’s not a large exhibit, and I saw most of it. It’s divided into four sections, each with a theme — observation, contemplation, creativity, and society — and each section had an eclectic mix of objects, including rare books, journals and diaries, artwork, sketches, videos, cuneiform tablets, and interesting objects belonging to famous and not-so-famous people. My two favorite objects were a lock of Mary Shelley’s hair — a beautiful reddish-brown — and Virginia Woolf’s walking stick, the one she had at the end of her life. There was also Charles Dickens’s letter opener, with his cat’s paw as handle (you can see a picture of it here if you scroll down a bit). I saw a page from a draft of “The Waste Land” with Ezra Pound’s handwritten corrections and deletions, Charlotte Bronte’s traveling desk, a page of Virginia Woolf’s diary, a page of Jorge Luis Borges’s handwriting, a draft of a speech Hemingway gave, and a letter written by Keats. There is a hand-written manuscript of the Declaration of Independence and a copy of David Copperfield marked up by Dickens in preparation for public readings. There was also a Gutenberg Bible. I love seeing these kinds of things. There’s something mysterious and wonderful about laying eyes on an object that John Keats or Virginia Woolf touched. It allows me to imagine their mundane, physical existence and makes them seem more real. So, if you’re in New York City with some extra time on your hands, check it out. Didn’t I just write a post about an extended power outage and how I couldn’t blog for a while because I didn’t have reliable internet access? Why, yes, I did. Well, the power is out again, not because of a hurricane this time, but because of a freak October snow storm that took down so many trees and branches that 90% of my town was left without power. We’ve been out since Saturday night. I’m realizing now that the power outage in August, which lasted four days, was a lovely, idyllic time: the temperatures were mild and school hadn’t started yet, so I could just sit around and read, guilt-free. This time, the temperatures are in the 50s, if we are lucky, during the day and in the 20s or 30s at night, and we have no fireplace, wood stove, or generator. The house has been fluctuating between 47 and 52 degrees. Brrr! We are okay, just bundled up and spending as much time at work and at the local coffee shop as possible, where there is heat and light. We’ve had very kind friends offer to let us stay at their homes, but so far we’ve felt that the benefits of being in our own place outweigh the possibility of more warmth. I just want to sit on my own couch, even if it is freezing. Our power company is estimating that the power will be back by Friday at midnight, although it’s possible we will get it sooner. I’m sure hoping so.